Our new team member Tarun assisted in conducting his first smartphone workshop. Here is his experience! 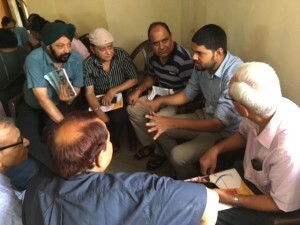 “Today was my first experience with conducting a “Digital Literacy Programme” for seniors, at Safdarjung Enclave Senior Citizen’s Association. This program was organized by Samvedna Senior Care Foundation, in collaboration with HelpAge India. 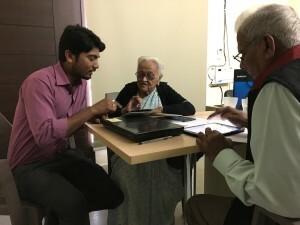 Samvedna Senior Care Team along with Helpage India conducted a smart phones workshop for the Senior Citizens Association of an apartment block in Rohini Sector 13, New Delhi. Our team taught seniors online payment transactions, WhatsApp and Facebook and answered their queries about these topics. The program started at 11:30 am with a brief introduction about Helpage and Samvedna Senior Care. Technology has become an essential part of our lives. We have become dependent on various gadgets to make our life easier. This was not always the case, earlier people were more dependent on each other to complete tasks. One important gadget which has taken an important role in our life is our “smartphone”, be it for calling, chatting, shopping, monetary transactions or any other thing – our smartphone manages all.